New from Latin Percussion. 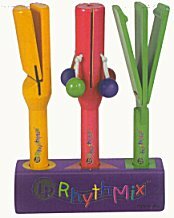 Three brightly colored hardwood percussion instruments that are fun and easy to play. Storage base teaches both color and shape associations. Base and musical activity booklet included. Sold as set only. Ages 3+ These are safety-tested and age graded products. All RhythMix items are ASTM and CE approved.